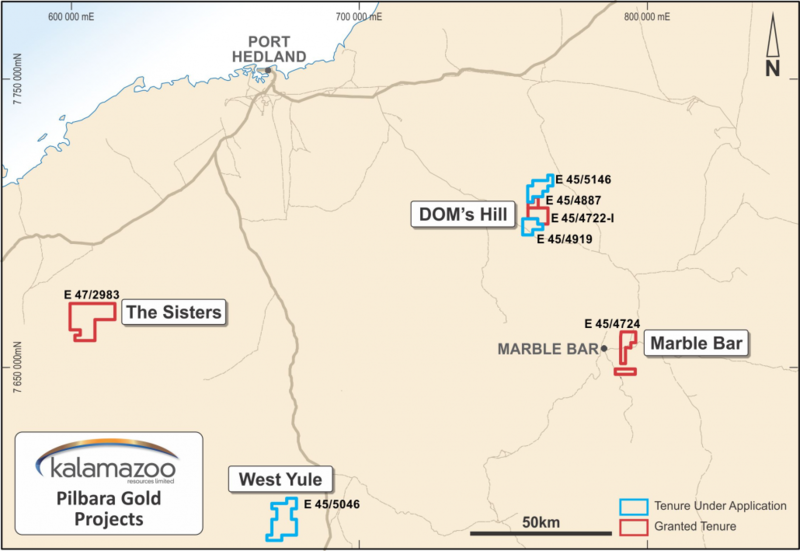 Kalamazoo Resources Limited, (KZR) exercised an option (ASX: KZR 6 October 2017, ASX: KZR 17 April 2018) to acquire between 80% and 100% equity in three highly prospective gold projects in WA’s Pilbara regioncovering 252 km2. The tenements, previously owned by companies associated with WA resources industry stalwarts, Denis O’Meara and Brett Keillor, have the potential to host significant gold mineralisation. 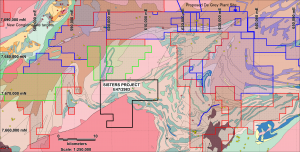 Subsequently, Kalamazoo made applications (ASX: KZR 10 November 2017) for two highly prospective tenements E45/5046 & subsequently, E45/5146, in the Pilbara. The projects are within proximity to some of the Pilbara’s most exciting gold projects and located in proximity to the gold projects of Novo Resources (TSX.V: NVO) / Artemis (ASX: ARV), De Grey Mining (ASX: DEG), Venturex Resources (ASX: VXR), Impact Minerals (ASX: IPT), DGO Gold (ASX: DGO) and Calidus (ASX: CAI). 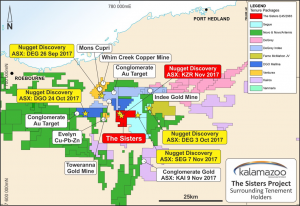 The option tenements comprise two granted tenements and one application totaling 68km2 and located 110km south east of Port Hedland. KZR has subsequently also made other (ASX: KZR 17 November 2017) applications in this area for ELA /5046 and ELA 45/5146. The project overlies the Warralong, Doolena Gap and Marble Bar Greenstone belts as well as the unconformably overlying Gorge Range Group, the younger Lallah Rookh Synclinorium and the overlying Fortescue Group. The tenements cover the major domain bounding Gorge Range, Muccan South and Bamboo Creek Shear Zones as well as numerous second order shear zones including the Dom’s Hill Shear Zone and the North-East Fault. The Project is prospective for a large variety of mineralisation styles and commodities. 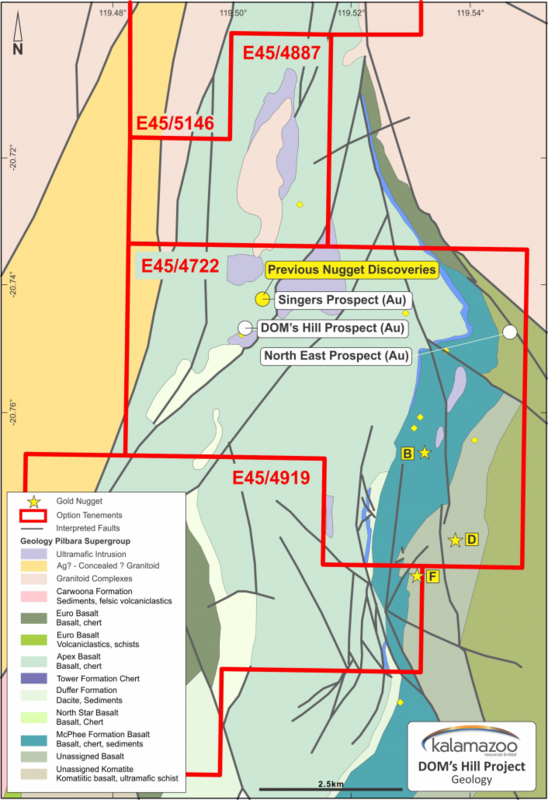 The recent discovery of a significant number of gold nuggets within the Project area, the exploration success of Artemis Resources (ASX: ARV) and Novo Resources (TSX: NVO) in the West Pilbara in a similar geological environment, and the resurgence of gold as a commodity of importance in the Pilbara, warrants robust systematic exploration, initially targeting gold at the site. Within E45/4722 tenement is the Singer Prospect (Figure 5). Great Sandy and prospectors have located up to 300 oz. of gold nuggets in this zone (refer to ASX: KZR 6 October 2017). No historic drilling has adequately tested this prospect. Assessment of this, and other areas known to shed significant gold nuggets, will be the focus of future exploration. At the NorthEast Zone Prospect, located east of the Doms Hill Prospect, gold mineralisation is associated with a north-east trending shear zone within a mafic and ultramafic sequence (Figure 5). As a result of exploration field visits by KZR and the use of contract metal detecting, Kalamazoo announced (refer to ASX: KZR 17 November 2017) the discovery of a second zone of gold nuggets discovered during early field exploration at the DOM’s Hill Gold Project (E45/4722). Figure 4. 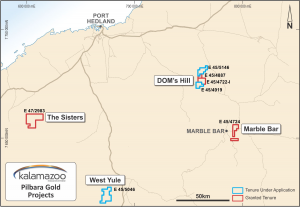 DOM’s Hill project showing the location of the DOM’s Hill Singer and NorthEast Zone gold prospects and the location of new nugget zone at DOM’s Hill. There are numerous gold, nickel and base metal occurrences within the project. The tenement is a granted 136km2 Exploration Licence located 100km south west of Port Hedland. 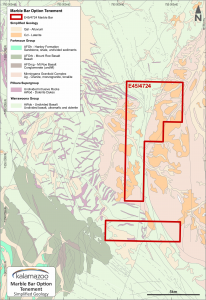 It is prospective for epigenetic gold mineralisation associated with the Mt Wohler Shear, a prospective splay of the gold mineralised Mallina Shear Zone. Kalamazoo recently announced (ASX: KZR 23 November 2017) further gold nugget discoveries and a gold-in-soil anomaly defined over 3km along the Wohler Shear Zone corridor at the Sisters Gold Project as part of its due diligence process. There has been no systematic historic gold exploration provides significant opportunity. 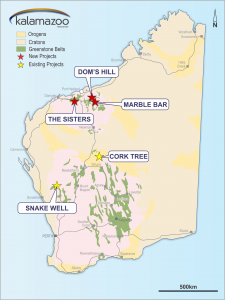 The Sisters Gold Project lies within a larger area currently undergoing significant gold exploration by TSX-listed Novo Resources (TSX: NVO) and ASX-listed De Grey Mining (ASX: DEG), DGO Gold (ASX: DGO), Coziron Resources (ASX: CZR), Arrow Minerals (ASX: AMD), Venturex Resources (ASX: VXR) and others. The Project contains the north-east trending Mt Wohler Shear, a major splay from the gold mineralised Mallina Shear to the north. There is no reported systematic exploration along this prospective shear. The Project is underlain by folded and faulted siliciclastics, volcanoclastics and mafic sills of the Mallina Basin, which is part of the De Grey Supergroup (3020 to 2930Ma). Planned exploration will target significant new gold mineralisation within the largely unexplored tenement. 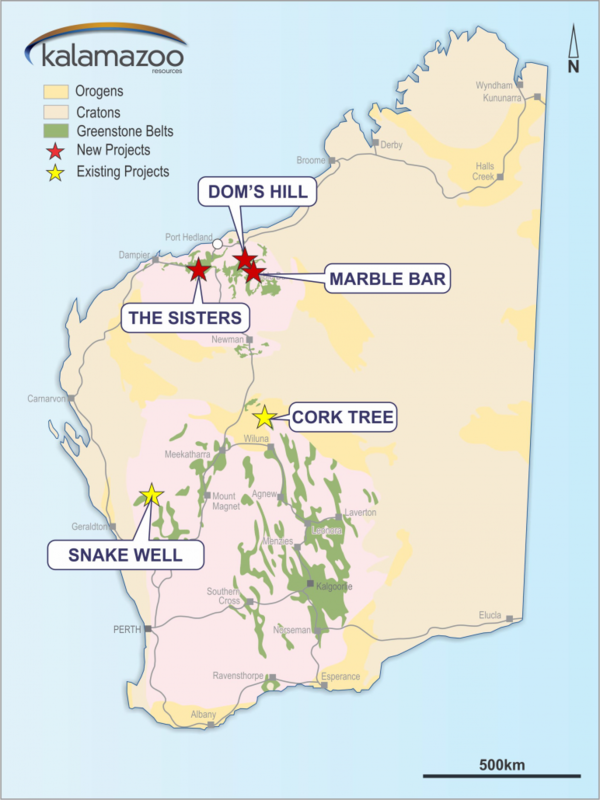 Strategically, The Sisters Gold Project is located adjacent to De Grey’s Pilbara Gold Project and within 30kms of De Grey’s proposed new purpose-built processing plant (refer to De Grey’s ASX release “Pilbara Gold Project 20% increase in Resources to over 1.2M0z” dated 28 September 2017). Indee Gold Deposit Style (Mallina Shear) – Orogenic shear controlled vein and lode zones hosted in metasediment. Dominant gold with arsenopyrite and minor base metals. Main spectral response is pyrophyllite, variable sericite (paragonite to phengite) and variable carbonate. Tourmaline – quartz –sulphide mineralisation – vein sets or “pipes” with anomalous gold – Mt Langenbeck. These zones likely represent high level “pipes” to underlying Indee Suite granitoids. Main spectral response is tourmaline and sericite. Epithermal gold mineralisation – Associated with the onset of the Mt Roe volcanism. Deposits preserved by flood basalts. Alteration is variable sericite and pyrophyllite. 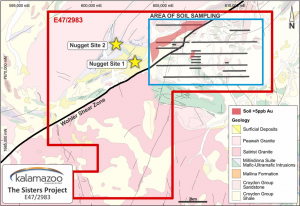 Gold nuggets were discovered by Kalamazoo (ASX: KZR 23 November 2017) during the early metal detecting program at The Sisters Project (E47/2983). 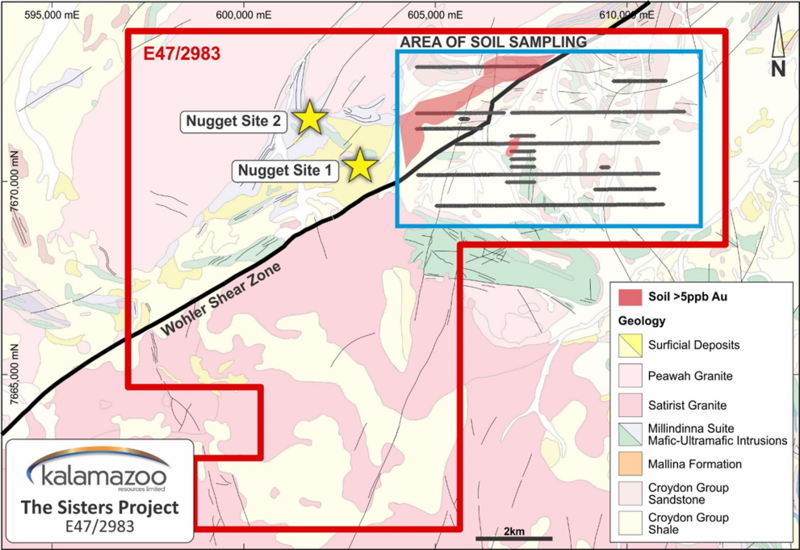 Nugget discoveries were located south west along strike from the gold soil anomaly and outside the area of soil sampling. 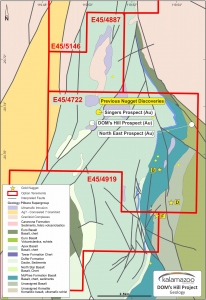 Nugget locations are in proximity to mafic intrusions and north-east structures indicating similarities to recent discoveries reported by ASX-listed De Grey Mining at Blue Moon (ASX: DEG 18 October 2017) (Figure 8 & 9). Following the re-sampling of soil samples initially collected by Sayona Mining for lithium exploration, Kalamazoo announced (ASX: KZR 23 November 2017) a gold-in-soil anomaly defined over 3km along the Wohler Shear Zone corridor and open to the north-east and south-west (Figure 9). This highly encouraging development resulted in Kalamazoo immediately undertaking a follow up dedicated program to determine the optimum soil fraction for detecting an expanded gold anomalism. 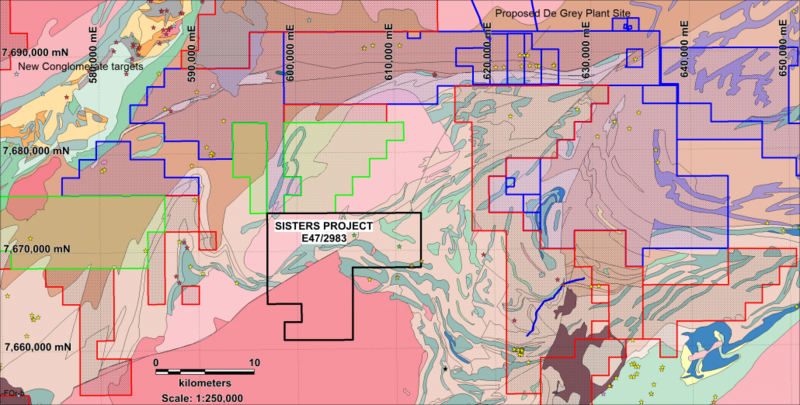 The Sisters Gold Project is partly underlain by Mallina Formation sediments, host to recent nugget discoveries by Arrow Minerals (ASX: AMD) (ASX: AMD 7 November 2017) (formerly Segue Resources) in the immediately adjacent E47/3476 (Figure 7). 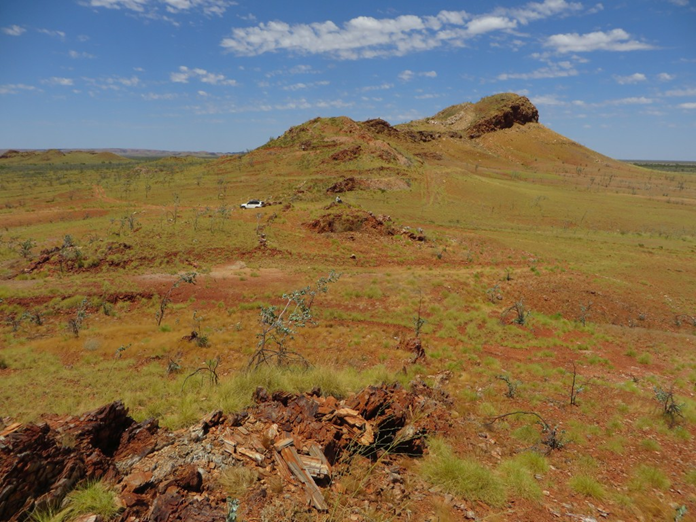 This tenement comprises one granted tenement of 48km2 located 6.5kms east of Marble Bar and 11kms north west of ASX-listed Calidus Resources’ Klondyke Gold Project located within the Warrawoona Gold project area. 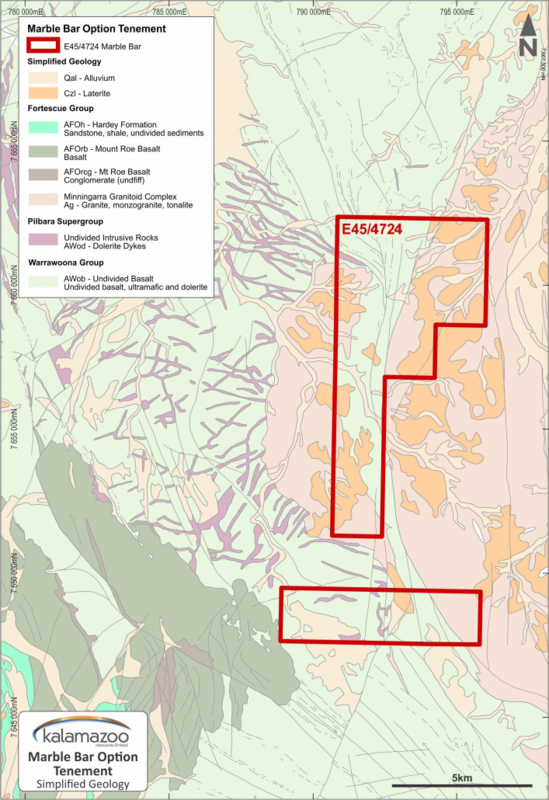 The southern boundary of E45/4724 is adjacent to Calidus’ tenement E45/4555 which contains the important and high grade Klondyke Gold deposit. This area has been identified by Calidus as containing drill targets for 2018/19 (refer to ASX: CAI 8 & 29 March 2018 and 5 & 12 April). Approximately 12kms of the prospective Warrawoona Formation stratigraphy occurs within E45/4724. Limited gold exploration is reported over the tenement area which provides an opportunity to add significant value to this project. The tenement straddles the western intrusive contact of the Archaean Mt Edgar Batholith and the adjacent basalts, amphibolites and ultramafic units of the Warrawoona Formation. Major northerly trending arcuate regional structures traverse the project (Figure 10). Exploration by Great Sandy to date has focused on lithium exploration. Calidus Resources Limited (ASX: CAI) commenced an aggressive resource definition and exploration program focused on the Warrawoona Project, located 21kms south east of Marble Bar in June 2017. Calidus has consolidated much of the Warrawoona greenstone belt for the first time and recently announced a combined JORC (2012) Indicated and Inferred Mineral Resource of 712,000 oz. within its Klondyke project area (refer to ASX: CAI 18 December 2017). In addition, Calidus has also announced a focus on two satellite zones, Fielding’s Gully and Copenhagen, as part of their assets-growth exploration phase (refer to ASX: CAI 30 January 2018) and the highlighting of over 45 high priority exploration targets from their regional target generation strategy (refer to ASX: CAI 8 March 2018). 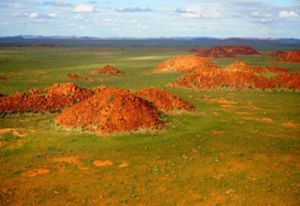 There is now strong recognition by the exploration community that the Warrawoona greenstone belt in the Marble Bar area has the potential to host significant gold resources. The Warrawoona Formation units within E45/4724 are poorly explored and justify a systematic gold exploration program. Kalamazoo’s review of the data for the Marble Bar tenement indicates it contains a sheared meridional greenstone belt which apparently has never been explored for gold despite the large number of small gold leases throughout the larger area (e.g. Haoma Mining NL (ASX: HAO) and the mines on-strike to the south (Klondyke Gold Limited (ASX: KLD). The potential for previously unknown gold occurrences in the favourable and structurally modified zones in the mafics/ultramafics is considered to be very favourable.